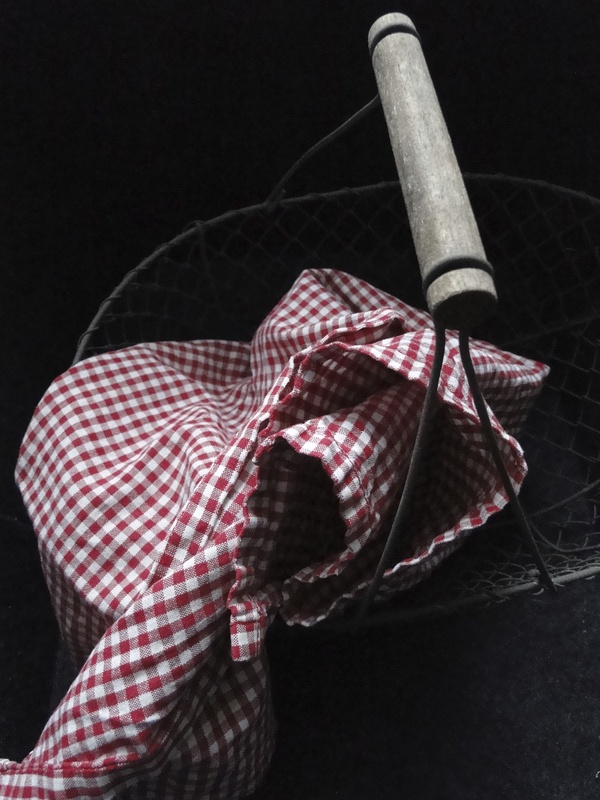 There´s nothing more old-fashioned and comforting than baking bread. It must be most satisfying to open up your oven door to take out the perfect loaf. Crunchy crust, airy dough, irresistible smell of warm bread fresh from the oven – what can be better? Yet, despite baking bread for quite a while now, this has never happened to me. Unfortunately. There´s always something: too much salt, too little salt. Wrong texture, good crust, good texture, too soft crust, dominant taste of yeast, and so on. Over time, reading and trying many bread recipes, I have come to the conclusion that I make about everything wrong. But being a keen novice, I have made some advances lately. My latest lessons in breadology taught me that I used a.) too much yeast, b.) too little water, c.) knead too little, and d.) add the salt too early. Also, e.), I have the wrong oven, because mine won´t heat over 230°C. Other than that, I´m doing perfectly fine. Before you start: sure to have a some ice cubes in the freezer? Combine water and yeast in a large bowl. Stir in flour with a fork. Cover with a towel and wait 20 minutes. On a well floured surface, add the salt, start kneading the dough, adding as little extra flour as possible, for at least 20, better 30, better 40 minutes. It will be quite sticky at first, but it will be better the more you knead. I prefer kneading by hand, even if it´s hard work in the end. The more you knead, the less extra flour you´ll need, the better the final texture will be. Depending on the amount of extra flour, a pinch of extra salt will be recommendable. Place dough (now slightly sticky and elastic) in a greased bowl, cover again and let prove for about an hour in your switched off oven. On a floured surface, roll out the dough to a roughly rectangular shape (about 30×40 cm/12×16 inch). Fold each of the four sides towards the middle to obtain a smaller rectangle. Turn around and place back into the bowl. Let prove for another hour or so (during each step, its volume should about double). Shape dough into 3 tubes of equal size. 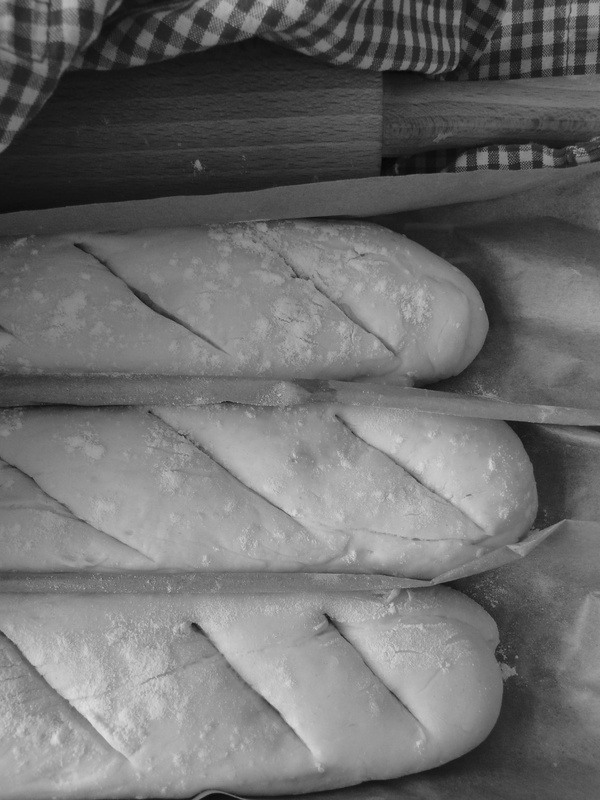 If you don´t have a special baguette baking tray, here´s an easy way to imitate one: Place dough tubes evenly on parchment paper. 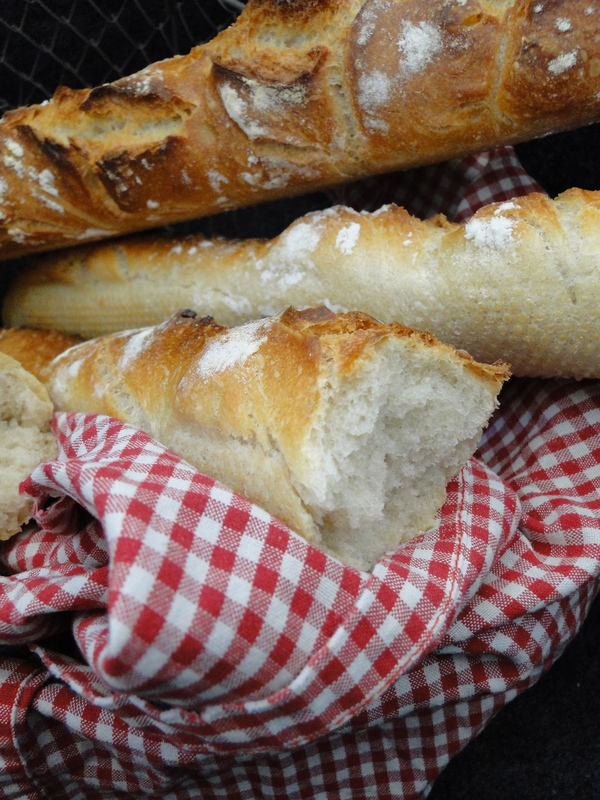 Create a rim for each baguette with the parchment paper in between breads, and place two firmly rolled kitchen towels or baking pins on the sides for stabilization (see photo below, more images here). Cut surface with a very sharp knipe or scissors, dust with flour. Let prove (covered) for another hour, at room temperature. Meanwhile, preheat oven with a cast iron skillet placed in the lower third (if you have a baking stone, place atop the skillet) to 230°C or higher. Place baguettes in the middle of the oven, add ice cubes to the cast iron skillet to create some steam. Bake baguettes for about 25 minutes, until golden brown and crispy. Es gibt einen Grund, warum viele französische Bäcker sich das stolze artisanal auf ihre Fahnen schreiben: Es ist eine Kunst, ein perfektes Brot zu backen. Schon lange versuche ich, dem auch nur nahe zu kommen, aber bislang vergebens. Zu viel Salz oder zu wenig, die Kruste nicht knusprig, der Teig nicht luftig genug, der Geschmack zu hefig – immer stört mich irgend etwas. Im Lauf der Zeit bin ich zu dem Schluß gekommen, daß ich so ziemlich alles falsch mache. Aber ich lerne dazu. Meine letzten Lektionen in Brotologie führten zu der Erkenntnis, daß ich a.) zu viel Hefe verwende, b.) zu wenig Wasser, c.) zu wenig knete, d.) das Salz zu früh zugebe. Außerdem, e.), habe ich den falschen Ofen, denn meiner heizt nur bis 230°C. Aber sonst passt alles. Bevor es los geht: Ist eine Schale Eiswürfel im Gefrierfach ? Wasser und Trockenhefe verrühren, Mehl dazugeben, mit einer Gabel durchmischen, 20 min abgedeckt bei Raumtemperatur stehen lassen. Teig auf eine bemehlte Arbeitsfläche geben, Salz dazu, mit gut bemehlten Händen für 20, 30, noch besser 40 Minuten kneten, dabei immer wieder ein wenig Mehl dazu geben, aber so wenig wie möglich – lieber länger kneten. Je nach zugegebener Mehlmenge mag eine weitere Prise Salz nötig werden. Teig in einer gefetteten Schüssel zugedeckt im ausgeschalteten Ofen ca. eine Stunde gehen lassen. Teig wieder auf die Arbeitsfläche geben und rechteckig (ca. 30×40 cm) ausrollen. Seitenteile zur Mitte, d.h. zu einem kleineren Rechteck, falten. Umdrehen und mit den eingefalteten Teilen nach unten in der Schüssel für eine weitere Stunde gehen lassen. Teig zu drei gleichgroßen Stangen formen. Auf einem Baguetteblech gehen lassen oder ein solches mit folgendem Trick zusammenbasteln: Brote gleichmäßig auf Backpapier anordnen. Das Backpapier zwischen den Baguettes so hochziehen, daß Rinnen für die Brote entstehen. Längsseiten mit zwei zusammengerollten Handtüchern oder Nudelhölzern stabilisieren (siehe Foto oben, mehr Fotos hier). Mit Schere oder scharfem Messer Baguettes mehrmals einschneiden, mit Mehl bestäuben. Zugedeckt eine weitere Stunde gehen lassen. Ofen auf 230°C oder höher vorheizen. Einen gußeisernen Topf ins untere Drittel stellen, evtnl. Brotbackstein darüber platzieren und mit vorheizen. Brote auf mittlerer Schiene in den Ofen stellen, Eiswürfel in den Gußtopf geben, ca. 25 min. backen. I have to make this recipe for my children! Beautiful breads! I can just smell them!!! Thank you, Mimi! Great you stopped by! 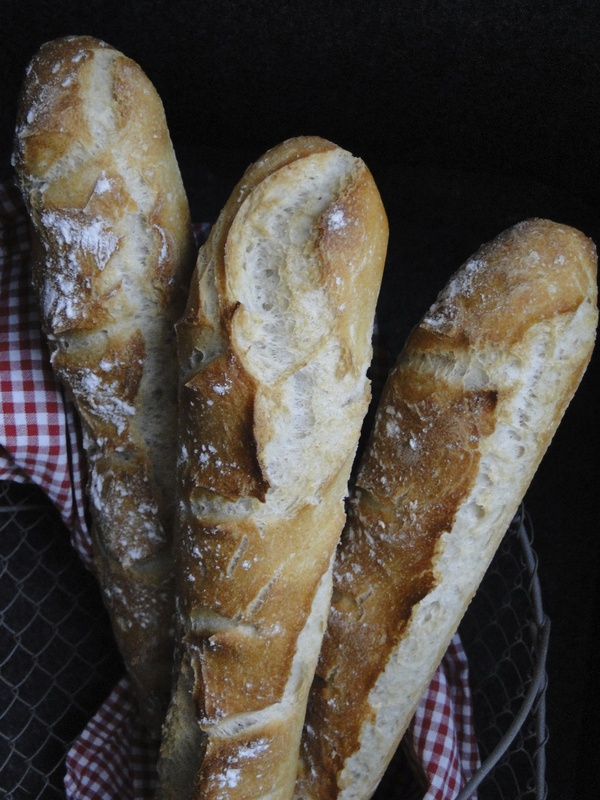 Sabine, I’m dreaming about these warm baguettes and a slathering of butter is just heaven. Thank you for sharing! …you´re most welcome, so happy you like them! And you´re right, they´re just fine with butter! 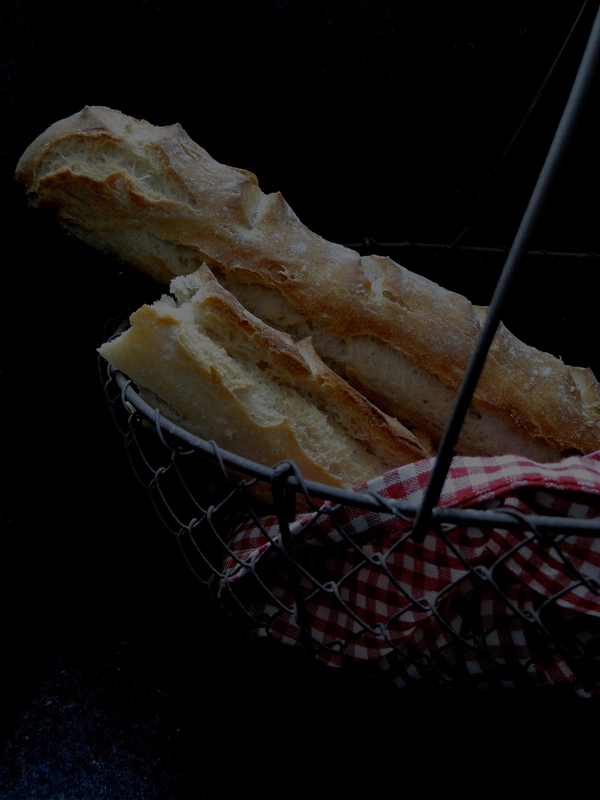 You should be proud…your baguettes look like they came from a great little french bakery. 🙂 I like the tip about adding rye flour. ….well this is just the best thing you could ever tell me about my baguettes. Thanks SO much. May I have some salted butter together with these amazing baguettes??? Sabine they are perfect! salted butter is of course a must, Margherita! Thanks for sneaking in! Wow, they are beautiful baguettes, and really look like they could have come from a good bakery! Congratulations, mastering the baguette is a real achievement! I’m still trying to improve mine, but you inspire me to keep trying. thank you, but your bread looks perfect, no need for improvement!